Vintage Jukebox: JACK DANIELS" CD-6 "Old No. 7 Brand"
Two major icons of American ingenuity and leisure culture combine in the festive Jack Daniels Jukebox. Bubble tubes on the sides and door front provide a mellow rhythm to the rotating and illuminated Jack Daniels pilasters. With its warm hues, luxurious exotic wood veneers and distinctive “Old No. 7” logo etched in the glass, the new jukebox is a perfect addition to home recreation room or bar. The Jack Daniels Nostalgic CD Jukebox joins the Harley-Davidson Nostalgic jukeboxes in celebration of the “rugged individualist” Americans who followed their passions and poured their souls into the making of distinctive, hand-crafted products. Steadfast in their values, each of the brands – Jack Daniels, Harley-Davidson and Rock-Ola – have famously refused to capitulate to market pressure and sacrifice their respective products’ integrity. These values have elevated each of the brands in international status and have come to symbolize uncompromising quality and reliability the world over. 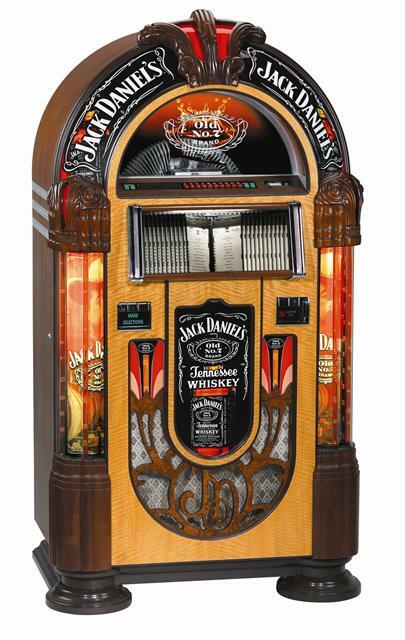 The Jack Daniels Nostalgic CD jukebox is available in both 115V and 230V (export) models. The Jack Daniels jukebox features built-in 5-speaker system with connections for external speaker set up in either single-zone stereo or dual-zone mono. The new Jack Daniels Nostalgic is powered by a professional-grade Peavey 1600 watt amplifier and comes complete with remote control.